Bought from Plumbworld before and the reviews look good on the mirror so I'm taking a punt! Thought I'd put it on here before it expires as it's the cheapest around. The large Cavalier bathroom mirror is the perfect addition to any bathroom - contemporary or traditional. With a high quality finish and stunning LED lights, the mirror makes for a functional, eye-catching piece. Battery power takes the hassle and extra costs out of additional wiring whilst retaining the LED looks. Overall, a gorgeous mirror that will set your bathroom apart from the rest. "Can be hung vertically or horizontally" - Might be useful for some people. Had one of these for about 18 months now. As a mirror it works as you'd expect ie you can see yourself. The LEDs are purely cosmetic and simply produce a bit of a glow, as you'd expect given they're powered by 2 x AA batteries. You'll never actually use them. The worst part, we found, was the hooks on the back which were very crudely welded/soldered to the frame and were not level. After I put 2 screws into the tiled wall ( perfectly level ) I hung the mirror only to find it was nowhere near level due to the poorly positioned hooks. I contacted Plumbworld about this and they sent a replacement, which was no better. I didn't want to re-drill the tiles so I ended up modifying the back of the mirror, so now it hangs straight. I would hesitate to recommend this mirror but, that said, for £34 it's probably not a bad deal ( we paid £45 ) as long as you're aware of the potential issues. Looks like this is how they're hung in case anyone's wondering. Is that really the back of one of those mirrors? So they don't fit particularly flush with the wall? Is that really the back of one of those mirrors? So they don't fit … Is that really the back of one of those mirrors? So they don't fit particularly flush with the wall? It has built in LEDs that require batteries - if it were flush you'd have to put the battery pack somewhere else. A least this way there's some sort of design gone into it. It has built in LEDs that require batteries - if it were flush you'd have … It has built in LEDs that require batteries - if it were flush you'd have to put the battery pack somewhere else. A least this way there's some sort of design gone into it. True, but it does mean you'd see the fixtures/side of it, surely? 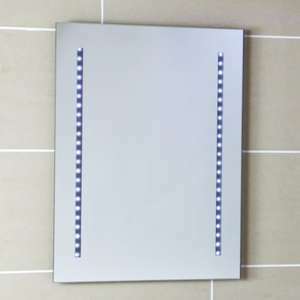 I know these are battery powered and require no wiring but if you have power in the wall, eg running to a shave socket or an overhead light, you should consider the new generation of mirrors that are not only illuminated but heated too so they don't steam up while you're having a shower. You don't have to wipe them clean so they don't get smeared. I fitted one in our bathroom and it's excellent.